The days may be shorter and the weather a little more unpredictable, but there’s still lots of biker events, ride outs and rallies happening during October. 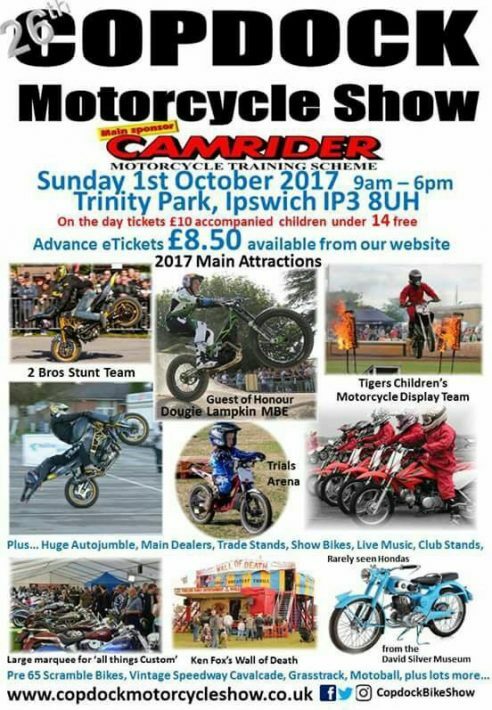 The Copdock Classic Motorcycle Club present the 26th Copdock Motorcycle Show this October taking place at Trinity Park Showground. The guest of honour this year is Dougie Lampkin MBE who will be taking part in the Trials Arena with some of the riders from the Ipswich MCC. The family fun day boosts a whole host of activities including Wall of Death, Moto-Ball, Junior Grasstrack and displays from Tigers Children’s Motorcycle Club and 2 Bros motorcycle stunt team. Also on display will be a large range of custom motorcycles and a selection of Classic Honda’s from the David Silver Museum. The show is sponsored by CAM Rider and tickets cost just £8.50 in advanced or £10 on the door. 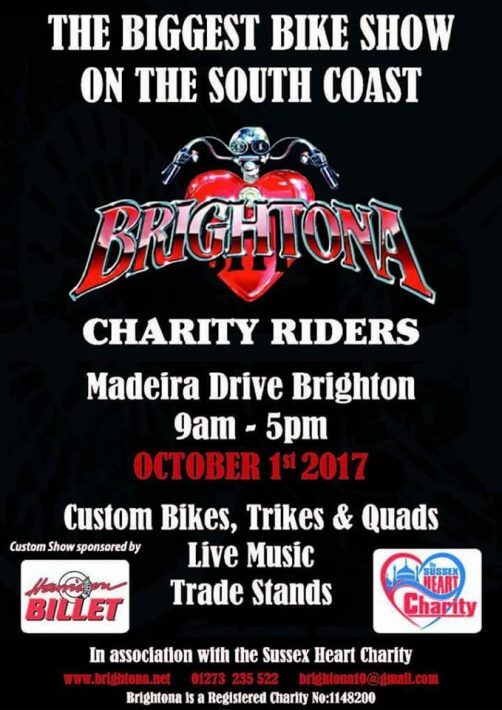 The annual Bikes and Bands event is back at Madeira Drive, Brighton! The whole day promises great entertainment, whether you’re passionate about bikes or not. There will be live music, trade stands and some epic bikes on display. Own a custom bike? Don’t forget to enter it into the competition too. All profits raised are donated to The Sussex Hearts Charity too, it’s only £5 for bike parking. Find out more information about the event now. 2017 marks the 10 year anniversary of the Ride to the Wall, a ride that is dedicated to remembering our fallen service men and women. Ride together with hundreds of bikers from across the country to raise money for the National Memorial Arboretum. All monies raised is dedicated to the upkeep of the NMA to keep the memory of those fallen alive. There are 11 different starting points in the UK that are marshaled by teams of 10. You can find out your nearest route here. It’s important to remember to start with a full tank of petrol, adequate protection and breakdown cover (this isn’t provided by the RTTW). Don’t forget to purchase your RTTW merchandise in advance of the ride. Find more about this fantastic event now! You’re invited to join the Caldicot Town Team in the annual Hoggin’ the Bridge ride 2017. The ride will meet at the Brightside Group PLC carpark, this is just behind the Severn Services, Junction 1 M48 with the parade starting at 11am prompt. As usual the ride will follow the route through several local towns and villages then finishing at Caldicot Castle. The ride is to raise money for charity including Meningitis Now and a select few local charities so donations are required, you can download a form here. If you decide to take part on the day, you’re always welcome to do so. There is also a ride in bike show on the day for those who would like to enter to show off their pride and joy and have the chance of winning a prize! The autumn classic bike show and jumble is back for another year held, as always, on the day the clocks go back marking the start of winter. Based at the Three Counties Showground, a whole host of bike clubs and shows are on display for the public to come see. There will be over 80 autojumble and trade stands for you to check out as well as the judging arena for the bike show. There will be an award ceremony and all participants will receive a complementary plaque too. Tickets cost £7 for adults and kids under 7 go free! All are welcome to take part in the London to Paris rally, it doesn’t matter what you ride it’s the taking part the counts. The event is to raise money for modern day slavery, and is also combined with two friends about to take on the adventure of a lifetime on a scooter and a sidecar! with a sidecar. They are taking on this challenge to set a new World Record and raise awareness and money for modern day slavery. Find out more about the As Seen From A Sidecar adventure now. The Dirt Bike Show heads to Stoneleigh Park for a four-day fun-packed show introducing all the new 2018 models for motocross, trials and enduro. There will be live action displays, stunts and competitions over the weekend as well as rider interviews and a lot more. Ever wondered what happens when you cross motorcycles and football? You get Motoball. Motoball dates back to 1926 and will be a main attraction at the International Dirt Bike Show. It’s not one to miss out! The show is open from 9.30am – 5pm Thursday through to Saturday, with a 4pm finish on Sunday. Tickets booked in advance cost £13, or £16 on the door. This is a great event for the whole family. Take a trip to Auto 66 Road Racing Club’s Sidecar Bash Bonanza at Cadwell Park. The weekend is the biggest sidecar based event in the whole country, and there’s a lot of fun to be had! 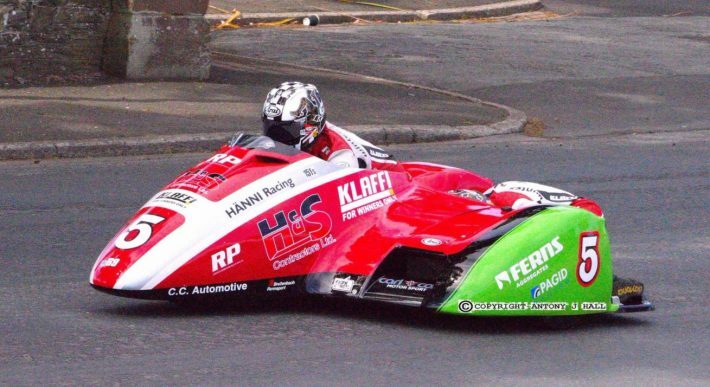 From BSB machines to patched up scooters, a whole host of sidecar three-wheelers will be there. Not only that, you’ll spot a few famous faces too! Camping on site will also be available so why not make a whole weekend of it. Weekend admission costs just £19 – book now to avoid disappointment! 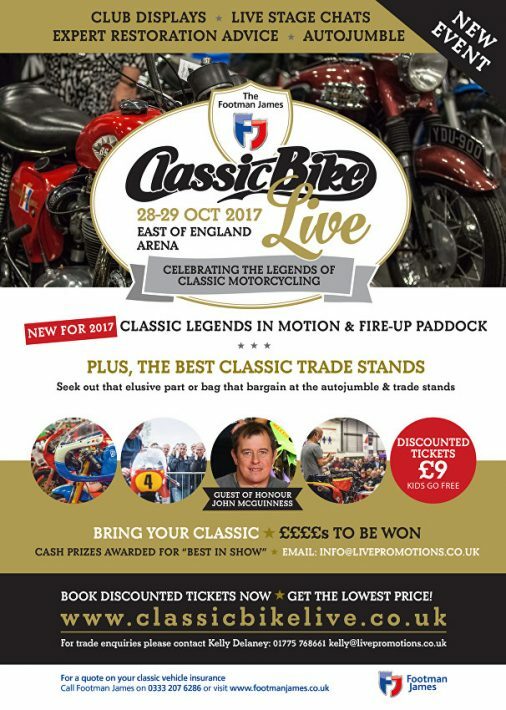 Classic Bike Live returns to Peterborough’s East of England Showground again this year for a fantastic two-day event. If you’re into your classic motorcycle then it’s the place to be with trade stands, retailers and special guests including John McGuinness as guest of honour. Over the weekend you’ll be able to marvel in some of the most successful racing motorcycles in history and listen to them being fired up in the paddock. Bring your own classic and enter the ‘Best in Show’ to see if your beauty has the chance of scooping the prize. Tickets start from £9 and kids go free! What events are you attending this month? Leave them in the comments below and we’ll add them to our guide.